Like a spy with multiple passports, the white whale is also known by other names including Block 1.01, lot 3 on the Neptune Township Tax Map. 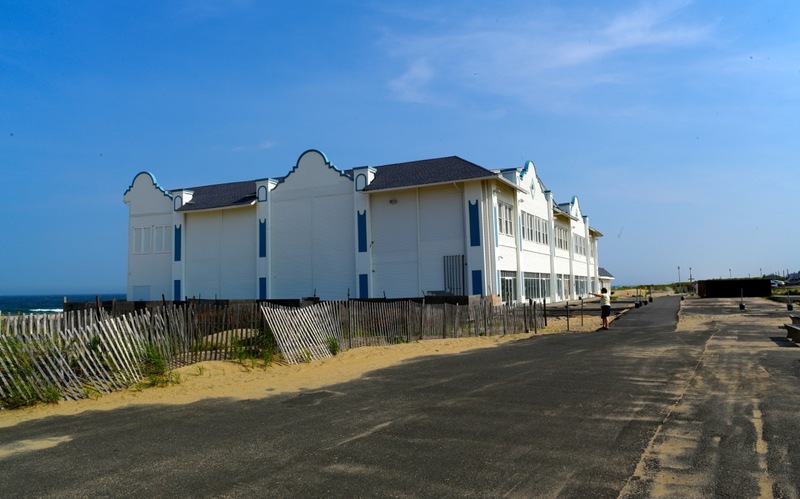 The Pavilion Building was built in 1909 right on the beach, before there was any zoning. It was a two story building as it is now and it was quite legal then since its usage was incidental to the recreational use of the beach. 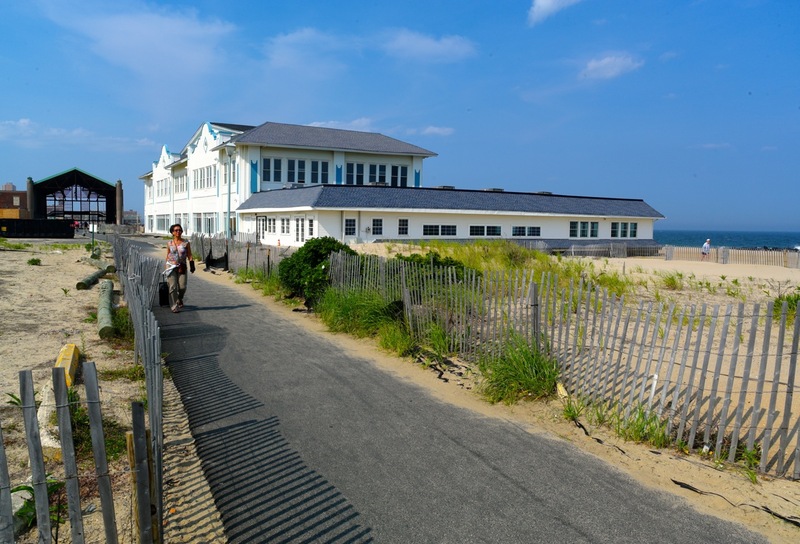 The Ocean Grove beach is under the protection of the State of New Jersey Legislature, via the NJ DEP. The Camp Meeting Association manages the beachfront and may charge admission to cover beachfront costs. At some point over the years, the Tax Assessor revised the Tax Map to show a tax parcel for the Pavilion Building. This was not a subdivision. It was for the purpose of sending a tax bill to the owner. The tax assessor assigned a street address in the tax book—-#4 Boardwalk. The Township Committee has no jurisdiction to zone the beach, which is reserved for recreation by the State, without permission from the DEP. According to Township records, the lot (block 1.01, lot 3) was never subdivided and no such permission was ever given. Although the Township Committee has been treating that parcel as a subdivision and applying a zoning designation to it, it appears that what they are doing may be illegal. Another problem with that zoning designation is that #4 does not front on any street. The boardwalk is not a street, and all lots in any town or city in America must front on a street. The Roman Empire invented this approach, and every town planner and engineer knows this. In 2006 the Township Committee passed a resolution to study the North End property as “an area in need of redevelopment.” The Planning Board recommended that the Township Committee designate the subject properties as an “area in need of redevelopment,” and that area included the White Whale (Blogfinger’s nickname for the building.). The Committee agreed. To create that conceptual design, the planners used the official tax map that showed the North End to consist of 6 lots including Block 1.01, lot 3. The Committee wrote the NERP into law in 2008. They included the White Whale lot in their NERP, and their planning consultants considered the lot to be subdivided and zoned when it legally is not. The Committee then zoned the “White Whale tax parcel” that was and still is reserved for recreation, to a mixed-use commercial and residential zone. The zoning for that building was essentially unchanged from before, although the NERP contained other parcels with major zoning changes. So now, with the recent introduction of a NEW NERP concept design, the WAVE developers and Randy Bishop want to turn #4 into a 4 story building with condos, banquet hall, and businesses . This would make a great skit on Saturday Night Live if it weren’t for the Monday night Committee schedule. a. Who are the owners of the great white whale? Supposedly it is the Maplewood Ocean Grove Assoc. Inc, and what relationship does it have to WAVE? Since the NERP includes #4, then where are the owners of #4 in all this? Are they keeping quiet because they see the money to be made with a 4 story Pavilion Building? And we are told that WAVE is the contract purchaser of the NERP site; does that purchase include #4? Are the owners of #4 and WAVE one and the same? When do we get the needed disclosures of who are involved in financing this ill- conceived plan? Randy Bishop promised that information recently. And what happened to the signed Redevelopers Agreement? That was also promised. b. When the owners of #4 rebuilt after Sandy, did they rebuild according to new construction standards for 100 year floods? 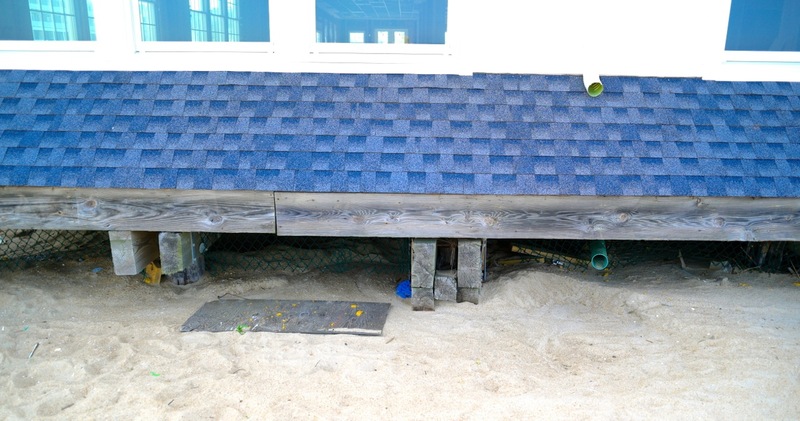 A photo shows how low the back of the building is to the beach—-it’s less than two feet. What, no elevated pilings? Is the work done on #4 post-Sandy legal? Does that re-construction create a hazard for the building’s owners and for future residents if the building is developed with the now permitted residential units on the top floors? c. The NEW NERP “concept plan” shows the original 6 lots turned into one; is this another illegal subdivision? And what official map did the planners follow? The new tax map with the new lot and block numbers (check your tax bill) is “to be used for assessment purposes only,” not for designing a NEW NERP plan. And isn’t it true that only the Planning Board can create a new subdivision? Does the Planning Board know that it will soon be sucked into another questionable zoning scheme ? d. Why was that new subdivision done and how will that help WAVE? Do you think it might allow vehicular access to #4 which currently is not on a street? e. Isn’t it time to challenge the conformity of the entire NERP plan? Shouldn’t the Township Committee come clean and explain all the details to the citizens. After all, NERP is a public project. Perhaps it’s time to dissolve the whole ill conceived plan before the cotton candy hits the fan? If Block 1.01, lot 3 is an illegal subdivision, then the whole NERP might be invalid. f. And don’t forget that the original NERP named the CMA and WAVE as joint re-developers, and that agreement is still in effect. So how can the CMA bow out of the process now? g. Finally, why is our Mayor keeping her distance from this entire process? In fact, only one Committee member seems to be involved. The Plan may collapse under its own weight. So if we set this topic to music it would be something like this ditty from New Orleans by Trombone Shorty, from the soundtrack of Tremé. Paul, Thank you for paying attention to the unbelievable goings on in the “North end”. It is indeed like a skit on SNL. Do the “powers that be” have any idea how strange they look to the rest of the world? I hope that your probing into the process and shining a light on it will help save Ocean Grove from an absolute disaster. As a property surveyor for 6 years, I can assure this is not the case. I have dealt with many properties that are completely landlocked from any road. NJ law allows property that is land locked an easement to the nearest road way across other properties, but there is no requirement that it must front on a road. There used to be a wonderful, family friendly restaurant in the White Whale called The Homestead. White tablecloths, great menu! I worked there the summer of 1963 – had a great summer working and going to the beach. So sad to see the building in this condition…..
Joe, as you know, you cannot subdivide a lot into two or more lots unless all the proposed new lots are fronting on a street. In the event that after the lot was legally subdivided, you now find that because of circumstances beyond your control, that the land is now “land locked,” and you cannot develop the lot, then the process you describe is correct. However, you cannot claim a hardship if the hardship was created by someone falsifying Government records. What role was Randy Bishop playing at last Monday’s Township Committee meeting? Unqualified director of Senior Center ? Former Township Committee member who never shared North End data? Owner (?) of Ocean Grove b&b?